I stand on one side of the spiritual ladder, and the Creator on the other. Every time I ascend to a new rung, I get to see to what extent He and I are alike. I, on my part, bring the vessel (desire), and the Light comes from the Creator. This is how the connection between us takes place. I experience all its components: myself, Him, and our oneness, as it is written, “Israel, the Torah (the method of correction), and the Creator are one.” On one hand, it is one whole, but on the other, it still consists of three parts between which there is differentiation. It exists due to the fact that in each spiritual Partzuf, there still remain empty desires in which I perceive myself, a “guest,” and Him, the Host who desires to fill these empty vessels. In other words, there are still limitations between us. A person who has reached even the first spiritual sensation sees that all of us are one with the Creator and fulfill His wish; nobody can go against the Creator. However, we are not talking about the picture that comes from the side of the Upper One and reveals itself to us, but rather about a person’s desire to connect to it and start acting. For the time being, we are being shown how unready we are to merge and unify. Everyone carries out the actions of the Creator, but does so without awareness, without one’s own desire, decision, or request. He simply acts thanks to the force of the Light that governs him and defines everything for him. Restrictions and concealments (the worlds) are our step by step discovery to what extent we are dissimilar to the Creator in His wish and action. This disparity is revealed only to the people who are able to correct it and attain equivalence. It is known from books and from authors that the study of the wisdom of Kabbalah is an absolute must for any person from Israel. And if one studies the whole Torah and knows the Mishnah and the Gemarah by heart, and if one is also filled with virtues and good deeds more than all his contemporaries, but has not learned the wisdom of Kabbalah, he must reincarnate into this world to study the secrets of Torah and wisdom of truth [because only with its help will he attain the purpose of his creation]. Therefore we must ask, why then, did the Kabbalists obligate each person [literally, every person!] to study the wisdom of Kabbalah? Indeed, there is a great thing in it, worthy of being publicized: There is a wonderful, invaluable remedy to those who engage in the wisdom of Kabbalah. Although they do not understand what they are learning, through the yearning and the great desire to understand what they are learning, they awaken upon themselves the Lights that surround their souls. This means that every person from Israel is guaranteed to finally attain all the wonderful attainments that the Creator had contemplated in the Thought of Creation to delight every creature. How Do You Measure The Upper Light? Question: What is the Matronita that The Zohar talks about? Answer: Matronita is Malchut. Our common desire to become similar to the Creator is called Matronita. The Creator (Kadosh Baruch Hu) is the general name of the Light of NaRaNHY that fills us. However, we cannot feel the Light by itself. What is the Light of Nefesh? How can I say anything about it? Right now I tried something and felt a sweet taste, calling it the Light of Nefesh. Then I tried something else and felt a taste that’s sweeter, deeper, and with different inner shades, and I called it the Light of Ruach. How can I measure them? I do it by the growth of my desires which have to reveal additional tastes in the new Light of Ruach compared to the Light of Nefesh. How many desires participate in feeling the Light of Ruach? Suppose there were five desires in order to reveal the Light of Nefesh. Now twenty more are necessary in order to reveal all the additional shades of sensation, which is called the Light of Ruach. But how do I measure this Light? I do it according to how many more sensations I still have to enact in order to reveal it. That’s why one person can be listening to an opera, enjoying it, and experiencing an entire spectrum of feelings, while another person sitting right next to him will keep looking at his watch and impatiently waiting for it to be over. Question: How do I keep the intention while being pressed by all kinds of obstacles? Answer: To keep the intention is possible solely with the help of the environment and a strict schedule: I have to know that there is a lesson to attend, and I have to come; I have chores and duties in the group, and I have to honor them. It’s forbidden to digress from the routine schedule in anything. Use all your free time to do more work than before. During a descent, the only thing that can help is your connection with the group where you do any work, like a diligent laborer, without the senses and intelligence of which you are incapable at the moment. The correct realization of a descent is when you are not trying to escape from it, but use it to ascend. If you think that you can handle it with your own desire and mind, it is totally incorrect. During the descent, a person doesn’t perform any clarifications nor does he have any feelings. He is dead, as it were. What is a descent? It is a reception of an additional, more exalted desire to feel pleasure. You are made to feel that your GE (Galgalta ve Eynaim) are being adjoined with the AHP (Awzen, Hotem, Peh) of the Upper One, and instead of your desire, you feel His. Previously, I had my own 10 Sefirot, and the Upper One had His. However, now I attach His desire to mine, my GE and His AHP, and there are 10 Sefirot once again. Instead of my small AHP, I have the addition of the AHP of the Upper One, the enormous desires that are willing to restrict and nullify themselves. This AHP is allowed to work with me, which places an enormous burden on me. Suppose I can lift 20 lbs, but am forced to lift 50 lbs. I can’t do it! They tied a 50 pound weight to each of my legs. Can I really take a step? Or, I was going to give somebody $10,000 and suddenly discovered that I, myself, have a debt for this very amount in my bank account. How can I now give the money to another? There are plenty of such examples in our lives. 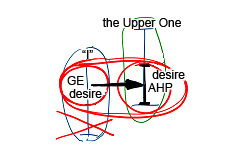 This is regarded as the revelation of the AHP of the Upper One. What can I do if I experience it as complete darkness? Is there any way I can handle it using my intelligence and emotion? What intelligence and senses? From my point of view, is there really any logic in all this? I was a “good child” at my rung, and out of the blue, I am loaded with the desires and duties that I cannot handle. Am I supposed to carry them all out in my present state, when I have lost my mind and senses and am completely lost and trapped in endless problems? How can one do anything alone? Salvation lies solely in the group, and doing any available mechanical work in it by yourself. This will be the starting point of your ascension to a new state. Gradually, we approach the correct perception of reality described by the wisdom of Kabbalah: All of the worlds are within man. The “world” (Olam) means “concealment” (Alama). In essence, the entire picture of the outside world that I imagine is a measurement of my dissimilarity to the Upper Light, the true and perfect reality. All we see is ourselves. Why does the wisdom of Kabbalah explain the perception of reality in such a great detail? What difference does it make if I perceive reality correctly, whether or not I understand it? I live in it, don’t I? The fact is that if by using the method of Kabbalah (the science of how to receive, how to perceive a true, correct reality) you manage to change yourself, then you change reality. When, with the help of Kabbalah, we begin to attract the Light and it changes us, then the very same Light onto which we project all of reality from within ourselves reveals a different picture of the world to us. In fact, every time I construct new worlds. In my perception, feeling, understanding, and comprehension I constantly add new, increasingly more real and tangible forms to this world than anything I am seeing now. Our reality seems minor and insignificant compared to all the other worlds that are revealed to me because the perception of the new world is more real than the world which we perceive today. Thus, I also gain control over perception of reality. It’s as if I am creating the movie that I want to stay in, the life that I’m living. The perception of reality becomes all of my life, my creation, since I am constructing the worlds in which I live. I gradually reach a degree where I construct the World of Infinity, a world without any limitations. It is said that the Creator has created the worlds and destroyed them, and man rebuilds and reconstructs them until he reaches a world of complete good, the World of Infinity. While ascending all of these degrees and correcting myself, I see the world that the Creator has made and a true reality appears before me. It is the most magnificent and exciting adventure! Laitman.com Post: Why Does Everything Exist? Question: How do I lower myself before the friends so as to accept the opinion of the group? Answer: Imagine that a group of mountain-climbers are making their way up to a summit. I, too, want to reach this summit, and that is why I join them. In this ascent I cannot do anything at my sole discretion. I cannot go back alone, nor do I choose when to have a rest break, who to spot, or who my spotter would be. We ascend together, bound by the same cable that’s holding up all of us. The same applies to the group. We are too weak to move individually and only advance if we realize and feel that we are bound together with unbreakable bonds. Initially I decide whether or not to go with the friends. I verify whether they are suited to me, whether they aspire for the same summit I do. Are they the people with whom I can make this ascent? Perhaps there are other groups out there? I am within my right to verify these things. But after I have verified everything and joined them, there’s no going back for we have already set out. The cable already binds us, as we are ascending to the summit. Now I cannot get rid of them or take a breather somewhere to the side, while they’re climbing upward. I must keep pace with them, step in step, along the same path. We walk together on our chosen path, and I cannot get away from this daily work. The conditions today differ from those in the past generations. In the past one was tested rigorously before being accepted, but in today’s times of general correction we accept everybody. And yet the might of the common soul that’s moving toward correction is made up of those souls who realize that there is no other choice. Having undertaken this task, they ascend upward, bound together by cables and following their guide, on the path where nothing can be changed anymore. A person is given time to realize what he’s facing and come to a decision. But this decision is crucial. The spiritual world is concealed from us, and so we don’t feel the nature of the task we’ve taken on. In reality this covenant with the friends is critical. We choose the group at the foot of the mountain, and once we set out on the path, there’s no going back. I don’t see how great, exalted, and even perilous this path is. Indeed, in the covenant I make with the friends dwells the Creator. This means I’m dealing with Him; it is He who testifies for us and affirms our covenant.